A nineteenth-century German game probably older than many western Pachisi variants. "The Chinamen's game". A children's game. 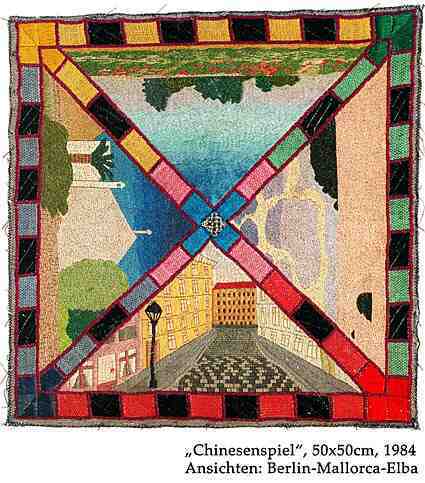 The Europeans (and the Germans) were somewhat obsessed with the Far East and it resulted in this game inspired by India (Pachisi) and China (the figures). Can be played by two, three or four people. Played on a deformed cross-and-circle board into a squared perimeter connected at the four corners by two crossing diagonals. Each player has one of the four Chinese figures (in red, green, blue and yellow). The figure starts in the matching colored square. The cubic dice has two white sides and the four rest of the colors mentioned above. If you roll your own color you advance one piece and can throe again. Throw an opponent's color and your turn is over. If you throw White you can throw again. It takes 28 steps to get round, and five to reach Home at the central intersection. Ashte-kashte is a race board game for two to four players originating in India. It is the direct ancestor of Pachisi. It is played on a board with a 7-by-7 grid on it. 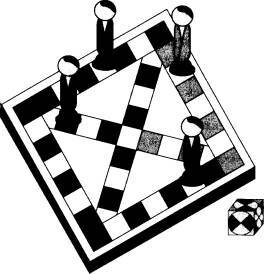 Players race their pieces around the board, spiralling inwards to be the first to get all of their pieces to the centre. Movement is controlled by throwing cowrie shells, but there is also an element of strategy to the game. The board is a square divided into seven rows and columns. The outer centre squares on each side of the board are specially marked. They are the starting squares for each player, and also function as resting squares. Each player has four pieces. Players begin with no pieces on the board. A pieces may enter the board on any throw of the cowries and moves to the square corresponding to the throw. Each player starts on their own starting square and moves around the board in an anticlockwise spiral. 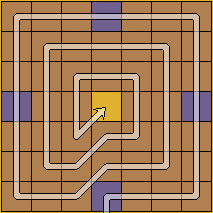 The paths of each player are different because each player starts on a different square and moves inwards at a different position on the board. A player can capture an opponent's piece by landing their piece upon it. The captured piece is removed from the board and must start again. A piece cannot land on an opponent's piece that is on a resting square. If a player lands their piece on another of their own pieces, it becomes a double. Doubles cannot be passed over by single pieces (whether the player's or the opponent's), and they can only be captured by other doubles. In addition, the two pieces that make up the double may be moved together. The end (centre square) can only be reached by a direct throw. If a player throws a number larger than that needed to reach the end, they must move another piece or wait till their next turn. Aggravation is the name of one of the many Pachisi variants. 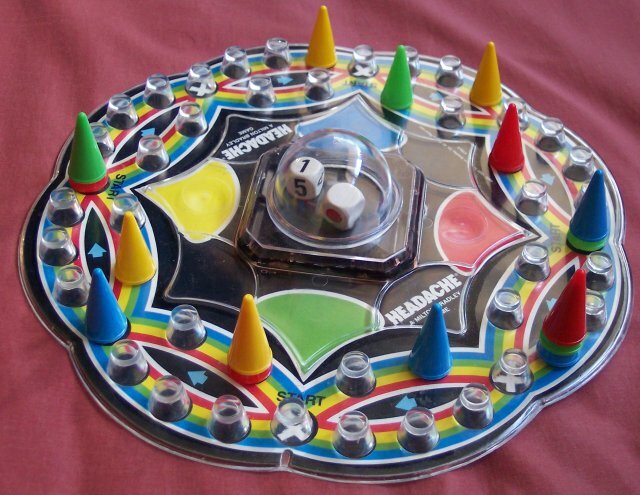 Its distinctive features are that the track is usually asterisk-shaped, to accommodate six players, that it is normally drilled to accept colored glass marbles as playing pieces, and that it incorporates "shortcuts." 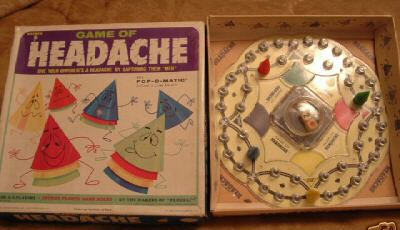 There are no "safe" holes where a player's marbles cannot be captured (or "aggravated," in the game's parlance). Each player rolls a single die to determine the number of spaces to move, with a roll of either 1 or 6 needed to enter the track. Each of the inside corners near the center of the board is a "shortcut," as is a hole in the center of the board: if a player lands a marble on one of the corner shortcuts, he or she has the option, on the next roll, of jumping from shortcut to shortcut, counting each jump as a single space; however, to do so, the player must be able to complete the move without leaving the shortcuts. If a player on a corner shortcut rolls a 1, he or she has the additional option of jumping to the center shortcut; from there, the marble can move directly to any corner shortcut on a roll of 1, but cannot move at all on any other roll. 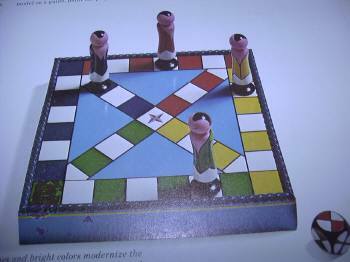 Another Pachisi variant, from 1968, for 2 to 4 players. Automatic, just press the bubble and your dice numbers roll up. Play your regular game of Pachisi, Parcheesi or Ludo. Have a lot of beer available. If you get sent back, or cannot move, take a drink. It's that easy.